Jesus drove the merchants out of the temple. The temple leaders questioned his authority. We look at their impudence, hypocrisy and dishonesty, and observe how Jesus answered (Matthew 21:12-15,23-27). ¶“12Jesus entered the temple courts and drove out all who were buying and selling there. He overturned the tables of the money changers and the benches of those selling doves. 13He said to them, 'It is written, My house will be called a house of prayer, but you are making it a den of thieves'.” (Matthew 21:12-13). ¶“14The blind and the lame came to him at the temple, and he healed them. 15But when the chief priests and the teachers of the law saw the wonderful things he did and the children shouting in the temple courts, 'Hosanna to the Son of David,' they were indignant.” (Matthew 21:14-15). ¶“23Jesus entered the temple courts, and, while he was teaching, the chief priests and the elders of the people came to him. 'By what authority are you doing these things?' they asked. 'And who gave you this authority? '” (Matthew 21:23). 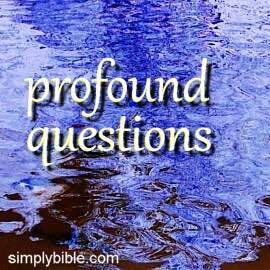 ¶“24Jesus replied, 'I will also ask you one question. If you answer me, I will tell you by what authority I am doing these things. 25John’s baptism —where did it come from? Was it from heaven, or of human origin? '” (Matthew 21:24-25a). ¶“They discussed it among themselves and said, 'If we say it's from heaven, he will ask why we didn't believe John. 26But if we say it is of human origin, we fear the people, for they all hold that John was a prophet. '” (Matthew 21:25b-26). ¶“27So they answered Jesus, 'We don't know.' Jesus replied, 'Then I won't tell you by what authority I am doing these things'.” (Matthew 21:27). This was the second time that Jesus had “cleansed the temple” of its money-grubbing merchants. At the beginning of his ministry he had done the same thing. ¶“14In the temple Jesus found the sellers of oxen, sheep and pigeons, and the money-changers sitting there. 15And Jesus made a whip from cords. He then drove them all out of the temple, with their sheep and oxen. And he spilled the coins of the money-changers and overturned their tables.” (John 2:14-15). ¶“16And he ordered those who sold the pigeons, 'Take these things away; do not make my Father’s house a house of merchants.' 17His disciples remembered that it was written, 'Zeal for your house will consume me'. ” (John 2:16-17). ¶“18So the Jews said to him, 'What sign do you show us to prove your right to do these things?' 19Jesus answered them, 'Destroy this temple, and in three days I will raise it up'.” (John 2:18-19). On both occasions the same question was asked: "What sign do you show us to prove your right to do these things? ... By what authority are you doing these things?" (John 2:18, Matthew 21:23). The answers Jesus gave were different. In the first case he gave a CRYPTIC answer that meant be would give them a sign when they killed him. He would rise from the dead. In the second event, he gave a CUNNING answer in the form of a question about John the Baptizer which threw them into a dilemma. On the second occasion the religious leaders should have understood Jesus better. They'd been exposed to Jesus’s teaching and miracles. But they hadn't listened and observed in a reasonable manner. "The blind and the lame came to him at the temple, and he healed them. But when the chief priests and the teachers of the law saw the wonderful things he did and the children shouting in the temple courts, 'Hosanna to the Son of David,' they were indignant." (Matthew 21:14-15). If they hadn't seen his miracles, perhaps we could understand their questioning his authority. But they would not acknowledge publicly the inevitable conclusion that one of them, Nicodemus, had earlier confided to Jesus: "Rabbi, we know that you are a teacher come from God, for no one can do these signs that you do unless God is with him" (John 3:2). The question was impudent because Jesus had clearly shown by his signs and wonders that he had great authority from God. However, these religious leaders were jealous. Their own authority was being shown up as not from God. Those in charge of the temple, the house of God, were allowing its sacred precincts to become a place of money making. Animals were being sold for sacrifice. Opportunistic merchants and bankers had invaded God’s house. Jesus was even moved to call them robbers. If anyone was going to question authority for what went on in the temple, surely these leaders should have questioned themselves. Who gave them authority to turn the temple into a market? Jesus was using the temple as a place for teaching truth and healing the sick. The things he was doing were perfectly scriptural and appropriate on that sacred ground. Yet his authority was questioned by those who were condoning sacrilege in that place. Jesus saw through the hypocrisy of these dishonest men. He knew they were rejecting him in the same way they had rejected John the Baptizer. So he threw that at them. He would answer their question if they would first answer his. Did John the Baptizer have authority from God to baptize for the forgiveness of sins? They could see the trap. By admitting John’s authority they'd condemn themselves. By speaking against John, they would anger the populace who believed in both John and Jesus. So they said, lamely, “We don't know”. They could not be honest one way or the other and face the consequences. So Jesus rejected their right to question him. After his death and resurrection (the sign), Jesus said to his disciples, "All authority has been given to me in heaven and on earth" (Matthew 28:18). That is the answer to the question. "God has highly exalted him, and given him the name that is above every name" (Philippians 2:9). In that name resides the authority of Christ over all. Let us not respond to Jesus with impudence, hypocrisy, and dishonesty, but rather with reverence, genuine faith, and truthfulness. —“By What Authority Do You Do These Things?” ...On YouTube (simplybible channel) you can watch a slide show of this lesson with voice included. Tap the title next to the arrow to start playing the video on YouTube.